featuring the music of BEAUTIFUL! "Carole King is inimitable. This show offers no substitutes. Instead, it draws your attention to the original. That’s the best homage there is." An iconic singer-songwriter gets a brand-new sound in CAROLE’S KINGS, the world’s first all-male Carole King tribute. With lush orchestrations, witty banter, and a cast of three incredibly talented New York stage veterans (one of whom plays live piano throughout the show), CAROLE’S KINGS is a dynamic act jam-packed with chart-topping sensations such as “The Locomotion,” “I Feel the Earth Move,” “You’ve Got A Friend,” and many more. An expanded set also includes songs by King’s friends and collaborators, including “You’ve Lost That Loving Feeling” and other hits by epic songwriting duo Cynthia Weil and Barry Mann. Recent performances have brought this act from intimate cabaret spaces in New York and Florida to prestigious headliner spots onboard Celebrity, Princess and Norwegian Cruise Lines. 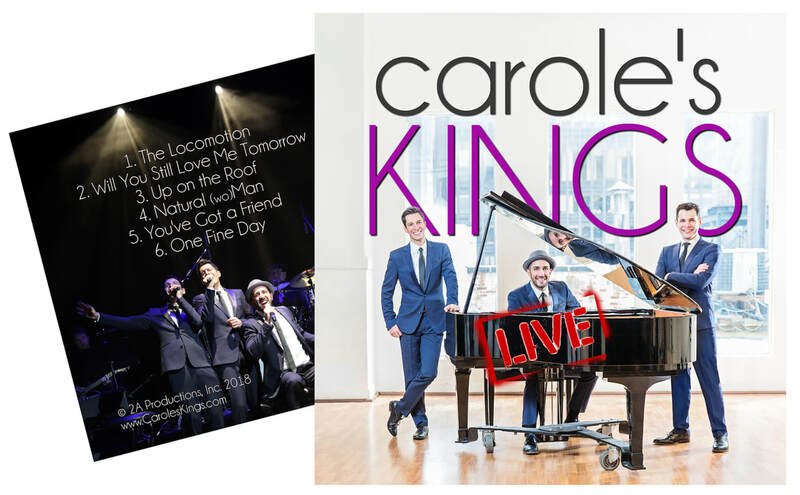 Amazing vocals, hilarious comedy, and a flexible band size perfect for presenters of all budgets make CAROLE’S KINGS a unique experience that’s fun for the whole family! Download the Carole's Kings 1-Sheet!